These are good days for silver exchange traded funds, both the physically-backed and equity-based varieties. No, 2014 is not yet reminiscent of the early 1980s when the Hunt brothers cornered the silver market. Nor is this year yet on par with 2010 when the iShares Silver Trust (SLV) surged nearly 83%, but considering the damage inflicted upon the metal last year (SLV plunged 36.3%), these are better days to be long silver. 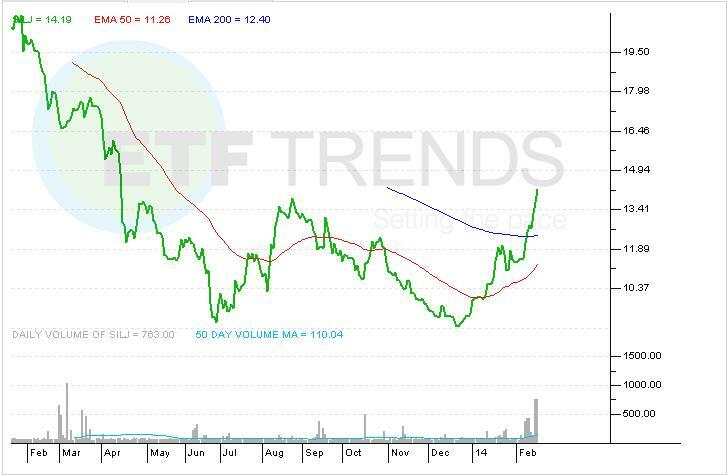 Investors have taken notice of SILJ’s out-performance of physical silver ETFs and rival mining funds. The fund started 2014 with just 150,000 shares outstanding, but that number has since swelled to 400,000. Even with the recent run-up, fundamental catalysts linger for higher silver prices. “Only a few central banks have any silver holdings at all and if they decided to start diversifying their reserves, they could really move the needle,” PureFunds CEO Andrew Chanin told ETF Trends. SILJ’s top-four holdings are Fortuna Silver Mines (FSM), Endeavor Silver (EXK), MAG Silver (MVG) and Silvercorp Metals (SVM). The quartet combines for about 46% of the ETF’s weight. Tom Lydon’s clients own shares of SLV.